Indian mining giant Adani filed an application with the Federal Court last week asking that a legal challenge to its proposed Carmichael coal mine be thrown out, unless the Wangan and Jagalingou Traditional Owners fronted up with $160,000 in potential court fees within two weeks. On Tuesday, Federal Court Justice Alan Robertson said that Adani’s demand was “disproportionate and unpersuasive”. He ordered that the traditional owners pay $50,000 in security costs by the end of January or their legal challenge could not go ahead. 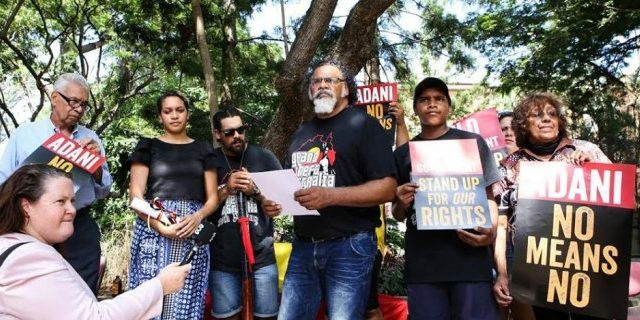 Adani’s attempt to have the Wangan and Jagalingou Traditional Owners’ case thrown out has caused the mining company further setbacks with its terminally delayed mine, as the case will now take place in May, when it was initially scheduled for next month. The traditional owners are appealing an earlier ruling by the Federal Court. They assert that the Indigenous land use agreement (ILUA) that is essential for the Adani mine to go ahead is void. In August, Justice John Reeves found that this claim had “no merit”. However, on Tuesday, Justice Robertson also upheld that the appeal will be going before the full bench of the Federal Court, as there’s an “arguable case of error” in the decision of the primary judge. Adani announced on 29 November that it’s going ahead with a scaled-down and self-funded version of the Carmichael mine. However, with rising opposition to it, as well as many regulatory hurdles to adhere to, many are sceptical that construction on the mine will ever begin. The ABC reported on Monday that the CSIRO has found Adani’s water management plan is flawed, as it doesn’t protect a spring complex close to the proposed site. The agency raised concerns about the level of groundwater draw-down the mine could cause at the Doongmabulla Springs. The CSIRO told the federal environment department that Adani has to do more work on its Groundwater Dependent Ecosystem Management Plan, which needs federal and state government approval for the mine to go ahead. And on Wednesday, the Wangan and Jagalingou Traditional Owners announced that their legal challenge will take place in May, as they’re able to cover the security costs due to donations from their supporters. The Federal Court ruled in February last year that all native title claimants must sign an ILUA or the agreement is invalid. Known as the McGlade decision, this finding jeopardised about 125 ILUAs that had already been established, as well as the yet to be registered Adani ILUA. So, the Turnbull government then passed legislation that amended the Native Title Act, making certain that only a majority of claimants need to sign off on an ILUA for it to be valid. The Adani ILUA was originally supported by seven out of twelve Wangan and Jagalingou native title claimants. Sydney Criminal Lawyers spoke with Wangan and Jagalingou spokesperson Adrian Burragubba about his thoughts on Adani’s latest tactic to try and thwart their ongoing opposition. Firstly, Adani asked the Federal Court to throw out your upcoming appeal, unless you put up $160,000 in potential court costs prior to the case. On Tuesday, the Federal Court ordered that you have to pay $50,000 in security costs by the end of January. Mr Burragubba, what do you think about the mining giant’s demand for the security costs and the Federal Court’s decision? The current position is that the Federal Court has allowed our appeal to go through if we can secure the $50,000 for the costs. We thought it was a bit harsh on our family council to even ask. First it was $300,000 and then $160,000. To even ask for $50,000 is a bit much, because our case really is in the public interest. And there shouldn’t be costs involved in this. It affects everybody. ILUAs that aren’t certified or registered properly – which could be in most cases because of fraud or duress – these are things that we have to bring to the court. In May, you’ll be appealing a recent decision of the Federal Court that found the ILUA relating to the Carmichael coal mine site was valid. You argue that the ILUA is a sham. In your opinion, why is the Adani ILUA invalid? In the case of the Queensland South Native Title Services – who’s the respondent – they didn’t certify the ILUA. So, we’re claiming that it is null and void on various grounds. It’s the certification of the ILUA. It shouldn’t have been allowed to go to the tribunal. Adani said in November that it’s going ahead with a scaled-down version of the Carmichael mine. What sort of mine are we looking at now? And what impact would it have in regard to your Indigenous nation’s claim to the land? It still has impact. Even though they have scaled it down, that’s just the initial stage, until they can obtain funding or sell the coal. The lease still extends to 40 kilometres by 13 kilometres wide. And the surrender area, where they will build the airstrip and the infrastructure, is still there. They can’t rezone the area to put the airstrip and the infrastructure in a different place. It has to be on that surrender area that is native title area of 2,750 hectares, which the ILUA relates to. Essentially, they need that approval because part of that Indigenous land use agreement also takes in part of the mine as well. They can’t discard our case. They still need the approval from the First Nations people through the ILUA. They need to be seen to be doing the right thing, so that financiers, investors and insurance companies can see that they are dealing with the Indigenous people fairly. That’s our argument. Initially, the argument was there wasn’t good faith in the agreement. And because of that we found ourselves at the wrong end of this argument, because the native title representative body got involved and they didn’t certify the ILUA properly. On Monday, it came to light that the CSIRO has found that Adani’s water management program for the mine is flawed, as it could lead to an ancient spring complex drying up. We’ve always argued that the Doongmabulla Springs are a significant site for the Wangan and Jagalingou people. It’s a dreaming site. A place of the Rainbow Serpent. We’ve asserted that in our court cases. Water is a vital factor to any coal mine production. Essentially, it will affect the aquifers. The draw-down from the mine would affect the springs beyond repair. It’s a difficult decision for the state government – the environment minister – to make a decision to grant that. This is the problem we are facing. There’s been a very long drought in central Queensland. And it’s very hot out in that area. Farmers rely on that source of water first of all. The amount of water that Adani intends to take could significantly impact on the groundwater. In February last year, the Federal Court ruled that all traditional owners must agree to an Indigenous land use agreement in order for it to be valid. In response to this, the Coalition government rushed through legislation to amend the Native Title Act that reversed this decision. This was thought to have been done in order to allow the progress of the Adani mine ILUA. What do you think this reveals about the system of native title in this country? The Native Title Act needs a total reform. These are things that we are bringing to the attention of any future federal government. If it’s Labor, we’d be addressing how the native title legislation needs total reform. And it doesn’t just need a Band Aid effect. Especially, because of the situation with the McGlade decision, where the full bench Federal Court ruling was that you needed to have a consensus of applicants before agreements on ILUAs could be passed by the claim group. When that ruling came down that Adani ILUA was dead in the water. We had a court case in the process while that was happening. George Brandis, the Attorney General at the time, entered our court case and essentially had it held over until the legislation was changed. So, our court case would have nullified that ILUA, because they had seven applicants and we had five applicants. My opinion is that there needs to be a total reform of the native title legislation to give Aboriginal people free, prior and informed consent in agreements. And for there to be a general consensus when it comes to signing around land, especially land that is of sacred significance to Indigenous people. You’ve been fighting the Adani mine since 2012. In that time the general public’s opposition to the mine has grown substantially. Earlier this year, Bill Shorten said he didn’t support the mine. But, Labor hasn’t directly opposed it. Do you have hope that the expected change of government next year could have an effect on the Adani mine going forward? There’s a lot of pressure from green groups and environmentalists. I do have some hope in a federal Labor government dealing with some of the issues with free, prior and informed consent, especially protecting our rights. I’m hopeful that a federal Labor government would be more sympathetic to our cause and that we are trying to assert our rights. So, how vital is it that the May appeal goes ahead? It’s enormous. We’ve been stung with something like $600,000 in court costs. And we’ve had the same judge in every case: Justice John Reeves. The same judge, who’s pro-mining. He wouldn’t let us get up on anything. This is the problem. We have to go to a higher court to have our arguments heard. That’s why it’s really important for us to have our day in court and hear these claims that we have: that the ILUA is invalid and it’s void of any merit, because of the lack of certification by Queensland South Native Title Services. These are the things that are happening right across the board with Indigenous people in this country. You have these land councils and these native title rep bodies, who are going in there and cutting agreements with these mining companies to make sure that ILUAs are all passed. And the real traditional owners are shouted down or they’re locked out of negotiations and agreements. It’s fraught with fraud, misconduct and misrepresentation. It needs a total overhaul, because too many lawyers are rorting the system and Aboriginal people are not granted any rights when it comes to negotiating on ILUAs. We’re just told to sign it and shut up. And that’s the problem. That’s what I was told. I was an applicant during the negotiations with Adani. And I mentioned certain things I didn’t agree with. And I was told to take it or leave it. And lastly, Mr Burragubba, for those out there who want to support your ongoing challenge to the Adani mine, how can they help? They can go to our website or to our Facebook page. They can see what we are doing. We have regular updates about the progress of our court case and what we are doing to fight for rights for not only our people, but other Indigenous people who are struggling with challenges with the Native Title Act. People can go to those sites and they can lend support or just get information about what we are doing.